MAX25, 25-Key MIDI Keyboard from Akai. Akai Professional exhibits at NAMM 2013 MAX25, a compact version of the MAX49 USB/MIDI/CV keyboard controller that was released in 2012. MAX25 has all of the same features as MAX49, including CV/Gate output, semi-weighted keys with aftertouch, a built-in step sequencer, expanded arpeggiator, and LED touch faders for gradual or instant parameter value changes. Like MAX49, MAX25 will come with AkaiConnect automatic-mapping software and Mackie Control and HUI modes for instant compatibility with many DAWs. 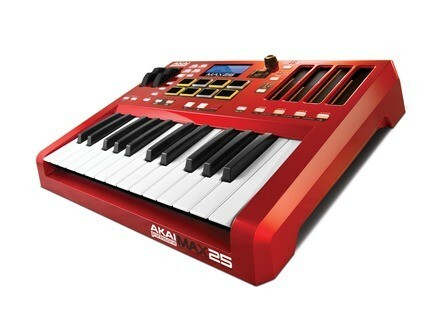 More information soon on www.akaipro.com. [NAMM] Behringer launches the iStudio stations Behringer introduces at NAMM 2013 the iStudio family of music docking stations for Apple iPad versions with 30-pin and Lightning connectors. [NAMM] Behringer launches U-Phoria USB interfaces Behringer introduces at NAMM 2013 four U-PHORIA USB audio interfaces equipped with Midas Xenyx mic preamps.